The Rinnai Rl94i Interior Tankless Water Heater (with Isolation Valves) is a top-tier choice in tankless heating, operation at up to 83% thermal efficiency. For use as either a residential or commercial model, this one is available in natural gas or propane options. With all of the benefits of tankless systems, space saving is at the top of the list. This system only reaches dimensions of 14” W x 23” H x 10” D and weighs 53 pounds. This is one appliance that doesn’t mind hiding away! Your plumbing demands will never be a concern again, with its ability to supply continuous hot water simultaneously to every faucet in your house or business. 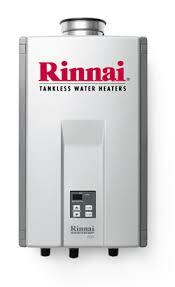 Rinnai is a name known for quality in the business of hot water. Find out why when you install the Rinnai Rl94i Interior Tankless Water Heater (with Isolation Valves). Clean, hot water, at the turn of a faucet, with less expense than you ever dreamed. For more information on the Rinnai Rl94i Interior Tankless Water Heating with Isolation Valves.